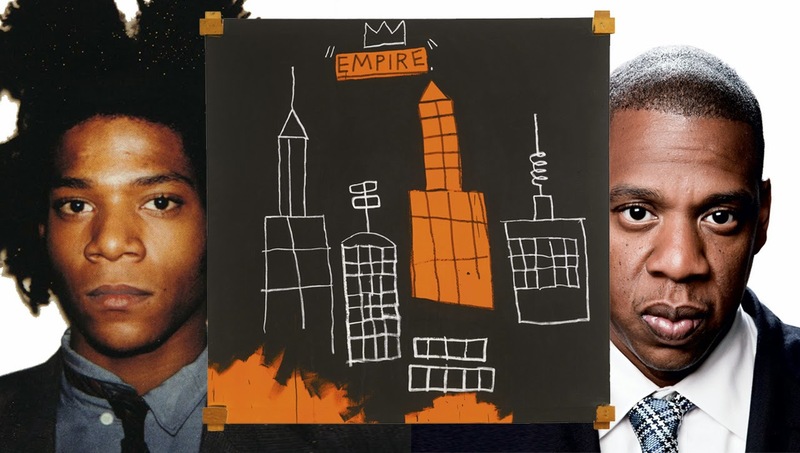 In 2013, this painting by Jean-Michel Basquiat (on left), called "Mecca"
During the 1970s graffiti began to consume New York City. It was also an expression of hip-hop culture and crossed ethnic boundaries as graffiti writers came from all walks of life, languages, incomes, ages and cultures. In the graffiti community there were two types of people; the writer and the tagger. Writers saw themselves as passionate, committed to the culture and true artists, and taggers were (ironically) seen as vandals and having no respect for property. Those spending a fortune repainting walls, buildings and subway cars completely disagreed with all of this. In time individual graffiti writers became known for their tag; some writers would even write in groups. Breaking the law, and entering the train yards, tags were put on New York City subway car trains using aerosol spray cans. The goal being that as the train traveled throughout the city it would be seen by all; traveling from station to station, and from borough to borough. This became known as "going all-city." Going all-city is parallel to a business's branding campaign. Branding is when a company brands its trademark, service or product name into the minds of the public. This is done in various ways. The motivation is vanity. Yet the statement is that the brand is the best, the preferred, the one to be desired above all. Branding campaigns also put into the minds of the public values, such as...saving you time...saving you money...giving you more. These values make consumers return to that brand time and time again. However, when branding your company's products or services the first question you must ask is: who is my audience? Be specific. Start by defining their age, location, and income. Most important, you must know the culture of your audience...what they like, what they value, what they believe in. When knowing these things your message will reach your audience immediately. In a crowd of words, your message steps out and communicates. Knowing the culture of your audience will also determine if you should advertise on radio, television, or through text messaging. Knowing the culture of your audience gives you a personal connection, and very soon your brand goes all-city in the minds of the public. Very few graffiti writers can claim all-city fame on the caliber of Jean-Michel Basquiat. His story is legendary! Born in Brooklyn, New York Basquiat's art fame began first as a graffiti writer, writing with a group. Over time his work went from the streets, to galleries and also museums worldwide. Basquiat died in 1988 at age 27. In 2013, music mogul Jay-Z, and fellow Brooklynite, purchased a painting by Jean-Michel Basquiat for millions of dollars in a Sotheby's auction.